Designed, Fabricated & Installed with Integrity. We manage projects with the highest level of professionalism from design to completion. Thank you both (Iryna and Ernesto). Everyone was pleased with how things turned out. You have a great team, and I hope we can work together again one day. Bleachers International provided us with a very competitive price, a timely delivery and installation. I would personally like to thank Mr. Ernesto Ramirez for his excellent customer service before, during and after the installation. Thanks again for going the extra mile in manufacturing a superior product that I am pleased to recommend. Bleachers International is a great company to work with. They are very prompt, organized and they communicated very well throughout this process. The crew that delivered and set up the bleachers and tables were very professional. They assembled everything and showed our Public Works Superintendent how to set the bleachers and how to move them. I would recommend this company highly to anyone. We have some projects coming up that we will be contacting them for. I cannot thank you enough, for all your efforts and how fast and amazing your staff is! You guys are truly a wonderful company and made this small league feel special – I cannot thank you enough! THANK YOU again! Such great work! Thanks again to you (Iryna) and Ernesto for getting them (bleachers) to us so quickly. We appreciate it very much! Bleachers International is a designer, manufacturer, and installer of aluminum bleacher and grandstand seating systems. We were established in 1993 and are located in Denver, Colorado. The company was founded on principles of honesty and integrity; those values remain a priority in everything we do. We have a superior rating of customer satisfaction by providing quality products you can rely on year after year. We offer a superior record of reliability and performance. Years of experience enable us to provide virtually any type of bleacher or grandstand, seating from 30 to virtually any number of seats. 30+ years of Project Manager experience. Extensive product development, manufacturing operations and construction projects. Designer of bleachers current IBC codes. MBA from Northwestern University. Our team of bleachers fabricators is also our team of bleachers installers. 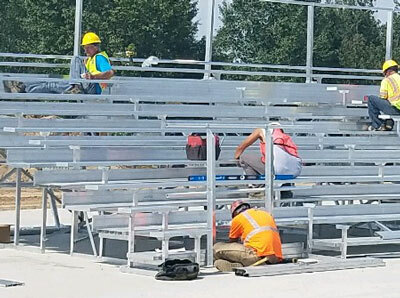 So when installing bleachers on a job site, the team knows exactly what was fabricated in the shop, which makes the process go smoother and faster. 4 years of Project Manager experience in construction. Key responsibilities are estimating, scheduling & logistics, as well as project management. Graduated with honors with a B.S. Degree in Construction Management.